The Pentium II is a glorified Pentium Pro with MMX extensions. The Pentium II has a different package than the Pentium Pro. This new package is called "Slot-1." Officially, Intel claimed technical reasons for needing Slot-1. 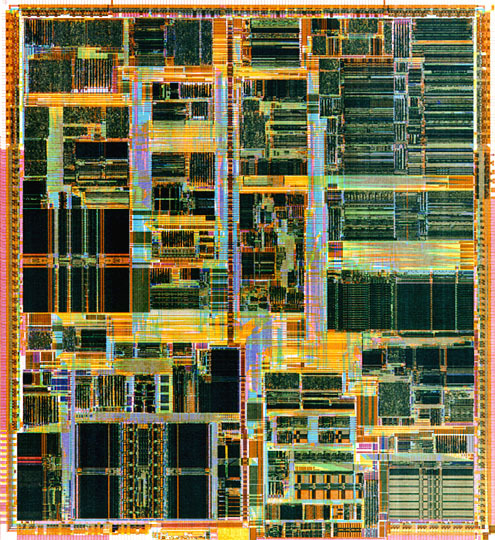 Industry pundits claimed that slot-1 was devised to thwart industry competition with the Pentium Pro, and further the Intel monopoly. Strangely, the "technical reasons for needing slot-1" evaporated as soon as the Pentium Pro was dead; as Intel somehow made a "breakthrough" that they had previously claimed was impossible (thereby "needing" to invent the proprietary slot-1). Slot-1 was also promised to be the upgrade path for consumers -- leading many years into the future. Unfortunately, every time Intel has made this promise, first with the 80486, then with the Pentium, the promise has been broken. As soon as Intel saturated the saturated the market with slot-1 computers, they announced the future high performance upgrade path would be "slot-2." The Pentium II can address up to 64 GB of main memory, but has cache limitations preventing memory use above 512 MB.